Well, I can’t quite believe I’ve gone 10 days without blogging! What’s up with that? Truth be told, I’ve been back on the roller-coaster of feeling good one day, crappy the next, terrible the next, then somewhat okay again…only to start the whole process over in some variation of the theme. 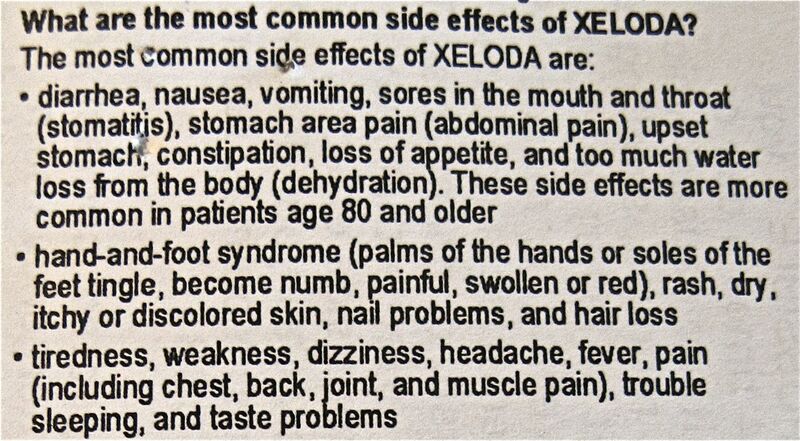 The reason I was shocked is that I’ve experienced every single one of the side effects listed here! And I’m not “80 or older” either! Granted, some of them have been worse than others (the “hand-and-foot syndrome” is currently the most problematic for me, closely followed by “tiredness, weakness, dizziness, headache.” But I can put nausea and vomiting at the bottom of the list, thankfully). A well respected acupuncturist, Leah Fineberg, who attends the same yoga class I do (she’s been across the room from me for a couple of years, but I never really got to know her until recently) offered to work with me to try to alleviate some of the side effects. I had my first appointment with her last week. It was also my first ever acupuncture appointment, so I was a little nervous. She immediately put me at ease by saying she might not even use needles on me during the session, but after checking my pulses, she said she felt I was strong enough for a few “baby needles.” I was pleasantly surprised that I felt nothing more than her soothing presence when she inserted a number of needles in my back along either side of my spine. A little later she put some in my feet and, again, I felt no discomfort. In fact, the entire session was very relaxing. But she impressed me the most by the research she had done before I arrived. She’d looked up “hand-and-foot syndrome” on the internet, and had also gone to the trouble to discuss it with her husband, an M.D. with whom she shares office space. She was able to tell me more about the condition than my oncologist had! It turns out the reason the problem arises has to do with excreting the toxins of chemo. I already knew that the chemo was passing out of me through my saliva, urine, and bowel movements, but I was unaware that it also leaches out of the pores of my skin, primarily through my palms and soles. In effect, it’s poisoning the skin – hence the discoloration and pain. Leah also told me that the two things I should avoid are heat and pressure on my hands and feet. Well, um, how exactly do you avoid pressure on your feet – unless you give up walking? And, avoiding pressure on my hands means: no gardening, no cleaning, no typing, no handicrafts! What am I supposed to do? Sit around and watch TV all day? (That would actually be another problem as I don’t have a TV connection…). And no hot showers? Are you kidding me? So, I’m in a quandary. I told myself I would try to make it the full six months on chemo. Then I told myself I would try to make it at least four months. But, here I am at the halfway point and I really, really, really want to quit. Leah’s husband, Don Fineberg, also took the time to talk with me. He could hear my desperation to quit, and he gave me some innovative ways to think about the decision. I am very grateful for his time and advice, and it definitely helped me focus more clearly on what my true goal is…but I’m still in a quandary. I sort of feel like the only reason I would choose to keep going with this treatment is to prove that I can. Somehow that just doesn’t seem like the right reason to continue. In my heart of hearts, I know I’m cancer-free and I strongly believe I am not destined to be one of the tiny percentage (less than 10% of cases like mine) that has a relapse. By taking the chemo for the past three months, surely I’ve reduced that percentage even more. HI Miss Karen, I just had a strong impulse to check your site and here you are….just minutes after I sat at the piano and played ‘your song’. I haven’t had the freedom to do so in weeks but have the house to myself for the moment….and at 5:45 a.m. I felt compelled…..compelled to sit at the piano and play ‘for you’. I included all of our goddesses too. I want you to know I think of you…and I don’t know how you do the things you do to get through this. And…you inspire me when I read what you are experiencing…that you keep going. Trust your inner guidance. You are very connected to spirit and choose what your heart truly knows. I support whatever you decide. Sounds like you are finding more angels to guide you on your path. You are so loved and missed. I feel our Invisible Threads keeping us connected. Miss Thing, you have to live your life by your own light. Your intuition and deep knowing about your body are your greatest tools in healing; engaging–yeah, touching–life is what keeps us present. Whatever you decide, your Angel Band (and a few coyotes) will be there with you… holding your hands (and feet) in love and trust. No pressure.